What a sight on a sunday morning. 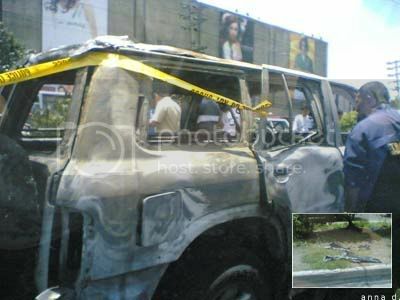 The photo shows a blown up Nissan Patrol in front of a local mall by north EDSA. The inset shows shards of the vehicle’s glass panes lying lazily a few meters from the Nissan. I’m not even going to speculate about the political implications of this incident. But I have my suspicions. On last night’s episode of GMA7’s Imbestigador, the show’s team dispersed 80 wallets across Metro Manila and watched what would follow. Each had Php200 in them. It was a test of honesty. Nice. They said the results would be shocking. But holy hell, I didn’t expect it to be this schocking. Out of the 80 wallets, 15 of them went to the lucky bastards’ pockets. A whopping 65 were returned to the owner. If the sample were qualified enough, it would be safe to say that roughly 81% of wallets lying on the streets of our lovely city would be returned to their owners. As much as I would like to rant over how much has been stolen from me, I think I’d like to stop here and end the entry on a positive note. Honesty still does exist. indeed. shocking. there is still honesty in the world. yey! well, if they put more money into it, i think a different result would have turned out. :P , say a thousand? that pic. so disturbing. hope it’s not stupid abu sayaff. must be done by the opposition. >_well, if they put more money into it, i think a different result would have turned out. :P , say a thousand? Augh. Was anyone injured during the explosion? And yeah, that really was surprising news. Surprising, and very, very pleasant. The widow, her son, and her daughter’s? The father got killed in a same incident months back. Oh my, Jom. I’m not entirely sure about this one. That’s such a horrible thing. I’ll look into it. They ran the same experiment a few years ago in New York City, and the results were about the same. But they had a small amount of money in each (I think it was just $20) and that probably somehow accounted for some of the honesty. They also filmed everybody and then showed it on TV, with some hilarious results!